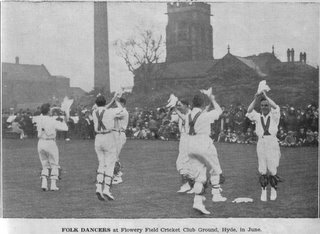 1930 From the start of 1930, the Men's Morris team were in effect, an autonomous group; although still part of the Manchester EFDS, they made their own practice arrangements and decisions on when to dance in public. 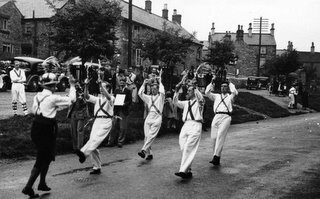 during WW2 MMM continued both practices and public shows, as there were sufficient dancers in 'reserved occupations' or 'employed in war work' locally. 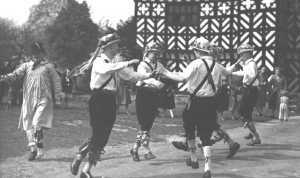 At times, the numbers were made up by one of the competent dancers from the Holy Name Scouts morris & sword team. 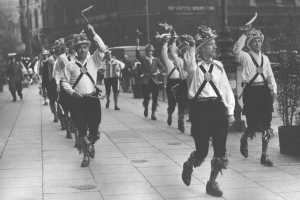 The 1950s was the decade that shaped much of what MMM are today ; with significant research into the North-west dances, the introduction of full day tours round the local areas, and the first foreign trip. Information on the 1960s is very patchy, as there is no scrapbook or other documents kept from the period. This was however corrected in 1969 with the introduction of a Log Book and scrapbooks. 1964 ... and we stop wearing hats for the Cotswold dances. Details, in the format used above will be added later. A more complete list of events, tours, and other facts about MMM is also available. Clicking the link at the start of this paragraph will open a 4 page 'pdf' file in a separate browser window.